To promote entrepreneurship and support new entrepreneurs, we are delighted to announce our partnership with website company SMBClix to launch our 2015 Start Your Own Business Survival Pack. This offer provides Accountancy, Tax and Website Support for all new businesses be they sole traders or limited companies. We want to ensure these businesses have the best opportunity for success. In excess of 50% of start ups do not succeed into year two we want to give all new business owners the best opportunity to succeed. We genuinely enjoy dealing with new business start-ups and get a kick out of the energy and positivity of people who make their business idea a reality. We are entrepreneurs ourselves and we firmly believe in fostering a positive and supportive environment for all early stage businesses. Without doubt, those early months are the most vital in the life of your business. Most businesses that fail do so in the first year, so it’s essential that you have a trusted financial guide by your side as you navigate uncharted waters. At CPC, we’ve helped hundreds of startups to make the leap from fledgling business to fully independent young company, now we want to help you. 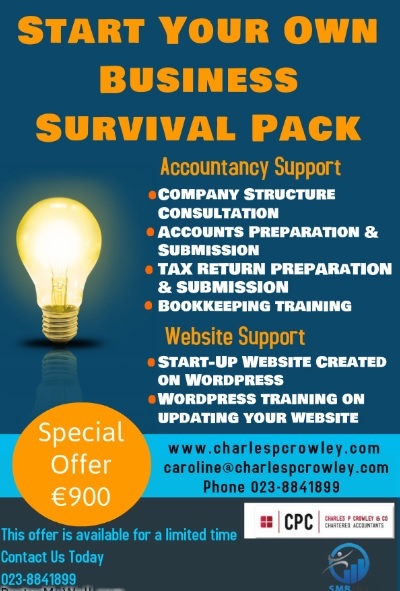 Email caroline@charlespcrowley.com for further information or contact us today on 023-8841899.